Adventure is the spiritual precursor to games such as The Legend of Zelda and Final Fantasy. Famous for being not only the first action-adventure game on a console, but also the first to allow a stash of items, first to use a "fog-of-war" effect, and, of course, its Easter egg. The first publicly-known Easter egg hidden in a game, born out of frustration against Atari's policy of not crediting its developers. This can be accessed by either using the long way (below), or by setting RAM address $8A to 1E. 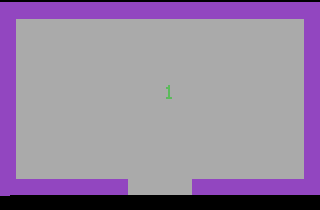 On difficulty 2 or 3, inside the black castle catacombs, embedded in the south wall of a sealed chamber (accessible only with the bridge) is an "invisible" 1-pixel object. You must bounce the cursor along the bottom wall to grab the dot. The dot is not actually invisible, but simply the same color as the wall and is easily seen when placed in a catacombs passage or over a normal wall. Unlike most other objects in the game, the dot is not attracted to the magnet. Bringing this dot to the east end of the corridor below the golden castle while other differently-colored objects are present causes the wall object to also become invisible, allowing you to pass into a room displaying the words "Created by Warren Robinett". Games developed by Atari, Inc.
Games published by Atari, Inc.
Games > Games by developer > Games developed by Atari, SA > Games developed by Atari, Inc.
Games > Games by publisher > Games published by Atari, SA > Games published by Atari, Inc. This page was last modified on 10 February 2018, at 12:10.